With Carnival season in high gear and French Quarter Fest, then Jazz Fest, just around the corner, New Orleans musicians become marathoners. Matt Perrine, whose sousaphone and bass has been a mainstay of the city’s sound for 23 years, is particularly busy, having rejoined Bonerama after a family-obligations hiatus. 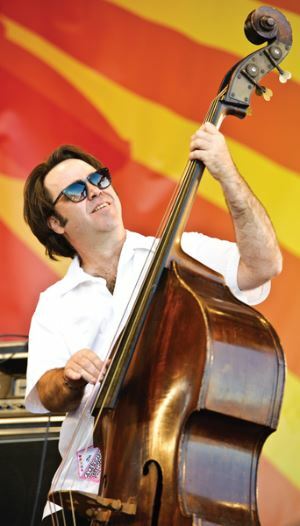 Perrine may miss a gig or two at the beginning of his renewed run with the trombone-centric crew as he balances commitments to the many other bands he plays with, including the Tin Men, Panorama Brass Band, Aurora Nealand and the Royal Roses, Alex McMurray, Debbie Davis and the New Orleans Nightcrawlers. Other than that, the only thing Perrine is going to be missing in the next two months is sleep. Do have any history riding or playing in Mardi Gras parades? The last few years I’ve been marching with the Panorama Brass Band in Tucks and Muses and a bunch of other parades. It’s fun marching in Mardi Gras parades and playing various types of world music – it’s part of the diversity of New Orleans music that I like very much. I’ve also ridden on parade floats. I remember one year I was standing at the top of one of the taller floats and I almost got clotheslined by power lines and phone lines across St. Charles. I had to do this kind of limbo act with my sousaphone to not get knocked off the top of the float. For a couple of years on Mardi Gras day I had the honor of marching with Pete Fountain in his Half Fast Walking Club. That was a great thrill. What’s the craziest thing that ever happened to you at Mardi Gras? The first couple of years with JULU. It was the early ’90s and Galactic would always play on Lundi Gras at Tipitina’s. They would get done at five or six in the morning then in the middle of the afternoon the Klezmer Allstars would play at Café Brasil. So between those two gigs, musicians from Galactic, the Klezmers, All That, and Iris May Tango, we’d all meet up on Jackson in time to see Zulu. As soon as the last Zulu float rolled by we would jump in and become the tail of the parade. We were not so interested in playing organized songs as much as serious Mardi Gras jams. Eventually the cops would reroute us off of the Zulu route, so we were just running through the streets of New Orleans, 20 or 30 costumed musicians and their friends, blocking traffic. Motorcycle cops would weave through us with their sirens blazing trying to disperse us and we would just part and let them go through then continue on our way. Finally the cops were saying “OK, if you’re going to do this at least let us know your route so we can clear the street in front of you.” We were a menace. That was probably the craziest and most spiritually rewarding Mardi Gras experience. I felt like I was helping to drive Mardi Gras forward. What’s the story behind you rejoining Bonerama? I was the original tuba player in the band and I played in the band for about ten years. When my youngest child was one and two going on the road became very difficult because I’d come home and he wouldn’t know who I was. That moved me to leave the band and try to stay in town a little bit more. It was a difficult decision for me because I’ve always loved the music and had quite a bit of affection for the musicians in the band. Craig Klein and I have been playing music together since I first came to town. It’s beyond friendship; it’s much more like he’s family to me. I really missed playing music with them and hanging out with them. With both of my children in school I can go on the road more now and luckily when I was available again the band didn’t have a permanent bass player. One of the problems with leaving a band and returning to it is the challenge not to try to turn the band back into something it once was. I really have to approach it like a new guy in the band and try to figure out what my place is now. The band sounds really different now than when I was in it. They found in my absence that electric bass was a crucial part of the sound of the band. They also have me playing tuba, but they love what the electric bass brings to the arrangements. And I love playing the electric bass so it’s an opportunity for me to rediscover my voice in the band. I’ve always wanted to be in a band that required me to play my various basses but it’s rarely necessary. Did the idea of Bonerama, an all trombone front line, surprise you when you first heard about it? I think we all were a little surprised by what happened. It started out with Craig and Mark Mullins inviting every trombone player in town—so there’d be eight, nine, 10 trombone players on the stage. On our first gig Mark had done an arrangement of Edgar Winter’s “Frankenstein.” By the second gig there was a much bigger crowd and people were screaming for Mark to play “Frankenstein.” Just like that. I think it’s important to note that I don’t think Bonerama could have started anyplace but in New Orleans. New Orleans audiences are ready for something different. If the idea had been generated anyplace else it probably would have just fizzled out. With the Nightcrawlers, you adapt a Verdi piece. Did the 19th century brass bands adapt classical themes as well, or is that something you guys came up with? I never heard of them walking down the street playing Beethoven or Mozart. The Nightcrawlers play the march from [Verdi’s opera] Aida. The reason that we do that is that at Mardi Gras balls that’s often the theme that’s played when the Queen enters. Many of us have played Mardi Gras balls with society bands. So the reason we do that is it’s a Mardi Gras theme song. You and Alex McMurray and Josh Paxton have a great simpatico playing with your wife, the wonderful vocalist Debbie Davis. Debbie’s parents are both opera singers and music theater singers. She learned from her parents how to let the song do the heavy lifting. I think that’s the secret to Debbie’s success. The three of us are supportive of what Debbie wants to do. She has the idea of the aesthetic she wanted the band to have. It’s her brainchild. If she needs a lead sheet I might write one for her but all the artistic decisions are left to Debbie. Josh Paxton came to town because he was a James Booker fanatic. The day he was married he visited Booker’s grave, picked a flower off the grave and wore it in his lapel. If I had to choose one piano player to help guide a young player into New Orleans music, James Booker is the one I would choose. It’s the perfect primer to New Orleans music, so that was basically all he really needed. Of course he also studies modern jazz, pop music and funk, so he’s very versatile. To explain our simpatico, I have to point my finger at New Orleans. Alex and I have obviously played together a lot over the last 16 years. During a lot of that period I see more of Alex than I do of my wife because we’re constantly working together. I probably know more Alex McMurray songs than he does. Before that I worked in Little Queenie’s band, Leigh Harris, which is where I met Josh. He used to like to play “Poinciana” in that band. Alex has become a great accompanist as well as being able to be the center of attraction himself, a difficult skill to master. It’s something I’ve watched Alex develop over the years. We first played together in Davis Rogan’s band All That and we went on to Royal Fingerbowl. Some of the Royal Fingerbowl material sounded like jazz, but we never played standards. Alex as a sideman has really developed in the last 10 years, playing with Ingrid Lucia and with Paul Sanchez. Paul’s book is always all over the map style wise. Alex is really coming into his own not just as a leader but a sideman. Is there someone in town who you’d like to play with who you haven’t played with? I’d say Mike Dillon is at the top of my list. I hired him one time to play tabla on a track in the studio but we’ve never done a whole gig together. I think that would be really exciting. I’m loving my life right now. I play with Panorama every Saturday at the Spotted Cat on Frenchmen Street. That band has the most unique book in town, it’s very challenging and I really have to work hard to get that music together. 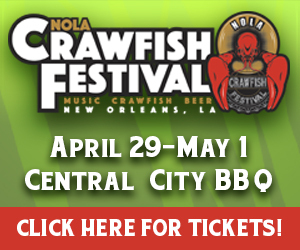 We play all sorts of New Orleans and Caribbean music, South American music. We play klezmer and Arabic music next to each other. There’s something unifying about music that this band particularly stands for. I’m thrilled to be playing with Aurora Nealand, she came here and took the town by storm. Aurora is such a talented musician and such a fine human being. I consider all the musicians I play with as part of my family. Bonerama coming back into the picture has completed that for me. I’m quite sated with all the sideman opportunities I have. Really glad you’re back with Bonarama. Looking forward to hearing what happens next. What happened to Nori Naraoka? He moved to New York!